With a population upwards of 37,000 people, Lake Oswego has a small-town feel with the benefit of Portland's nearby big-city attributes. Its properties are almost exclusively single-family homes, which are often wealthy residences located on large lots, some of the most luxurious of which are situated along the lakeshore. 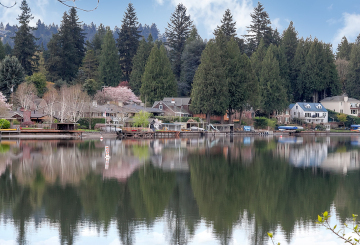 Lake Oswego is known for its excellent schools, which is why many people choose to live there. Lovers of history will appreciate First Addition, one of the oldest neighborhoods in town. The streets blend small, ancient houses with new larger architecture for an adorable eclectic look that preserves the crowded layout of a 19th century village.